One month of travel, two kids and three countries. We left Australia with 2 large backpacks and 4 smaller day packs between the four of us. Did we bring enough ‘stuff’? Yes. Did we bring too much? No, I don’t think so. There isn’t anything that I have come across yet that I think I must ditch at the next opportunity; except for the bottle of shampoo that leaked twice and the skin lotion that leaked once - but now that they aren’t so full and I pack them in plastic so they have continued the journey! Also I will look for bottles with screw-on lids for future purchases. iPods for children (they are using them right now on a 4 hr bus ride which means they ae oblivious to the totally inappropriate video that was just shown on bus tv). Amazon Kindle loaded with great books. Universal plug, elastic travel clothesline and Sard Wonder soap for laundry on the run. A supply of carabiners for clipping things together and to hook onto your hotel key. A $2 shop strong plastic zippered bag (15 x 25 cm) for holding all passports, tickets, licences etc. A body glove for scrubbing yourself in the shower – if you saw my boy’s feet before and after you’d totally understand its value, particularly after a full day at temples. One travel towel, from my work mates, and 3 cut down towels that have come in handy at water parks and in guesthouses without bathmats. Baby wipes for wiping down children and filthy bus seats. Croc shoes for Steve and the boys – multipurpose and easy to wash and dry overnight when they are covered in temple dust and mud from puddles stepped in accidently. Mini compass has come in handy a few times. Mini travel umbrella. Buy an umbrella in Asia or bring your own to keep off the sun. Head torches x 3 have been great for late night reading whilst others are sleeping. 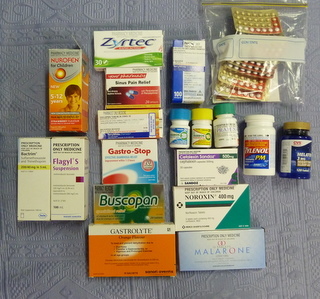 Medicatons : Nurofen, Buscopan, Gastrostop, antibiotics and antibiotic cream have all been utilised in the last month. First aid kit supplies came in handy to doctor Harris’s scrape to his face at Sunway Lagoon in Malaysia. Spare camera battery is an absolute must. Lipstick and mascara are a nice addition which I use to feel spruced up at times. Packing cubes are fabulous for keeping ‘stuff’ organised. A supply of tissues to get you started in Asia is a must for all toilet stops, even in the biggest shopping mall you may need to supply your own. One fold out shopping bag to carry groceries; stronger than plastic and not adding to land fill. Malaysia had a good supply of beautiful fold out bags to purchase. Not to be seen in Cambodia however. A supply of plastic bags is handy for dirty laundry and Ziploc bags for a multitude of items. A note pad and pen for writing down all sorts of valuable information and also collect contact details of the fabulous people that you meet along the way. Earplugs for noisy hotels and to block out bad movies/music on bus rides. I’m sure if I kept writing I could come up with more things for this list however that is enough to get you started and thinking about your own packing. Hope it helps. Leave a comment to share your ideas on what you have found a must to pack in your backpack and let me know if there is anything I forgot to mention. Great list! I love posts like this that give you practical advise! I am wishing you had an email sign up for this blog, I like getting new posts in my inbox….Maybe you could add one?